The Afghan Marijuana strain had to go through a long history before it became one of the world’s renowned pot strains. It originated in the Kush Mountain at the Afghanistan Pakistan border where the strain was perfected for centuries. The Afghan Marijuana strain is among the favored weeds by growers because it can survive almost any kind of environment, making it relatively easy to cultivate. This cannabis strain also vies well for medicinal and recreational purposes due to its high potency. It’s particularly easy to recognize an Afghan Marijuana strain because of its sweet smell. Since cannabis experts had worked on this strain for centuries before it became among the best, the Afghan strain eventually became the root element of the world’s legendary strains to date. Indeed, the Afghan strain is an attractive variant, but apart from that, it is also equipped with crystals that make it a beautiful cannabis plant. This kind of strain would be an excellent getaway for people who are experiencing constant stress. If you’re a business owner who is troubled about where your company will lead to next, perhaps you can use some of the sedative powers of the Afghan Marijuana strain. This cannabis strain is among the lot that is capable of providing intense relaxation. It gives you the feeling of wanting to lie down and just relaxes the whole day. If you’re someone who has trouble with sleep, you may also find solace in the Afghan Marijuana strain. Due to its relaxation elements, it won’t take long before your eyelids will suddenly close, leaving you in a slumber. The Afghan Marijuana strain is called the nighttime cannabis for good reason. Most people use this kind of strain when they have nothing else to do and just want to relax. It will definitely put you in an idle rather than active mood. While many people are putting the Afghan Marijuana strain to their nightly routine, I suggest that you prepare a few snacks with you if you plan to smoke this strain since it is going to give you some appetite cravings. You can also expect several laughs and giggles upon consuming this drug since the strain naturally makes its subjects gleeful and euphoric. Perhaps it’s because this strain originated in the mountains, but this cannabis plant will make you think of flower fields because of its earthy fragrance. 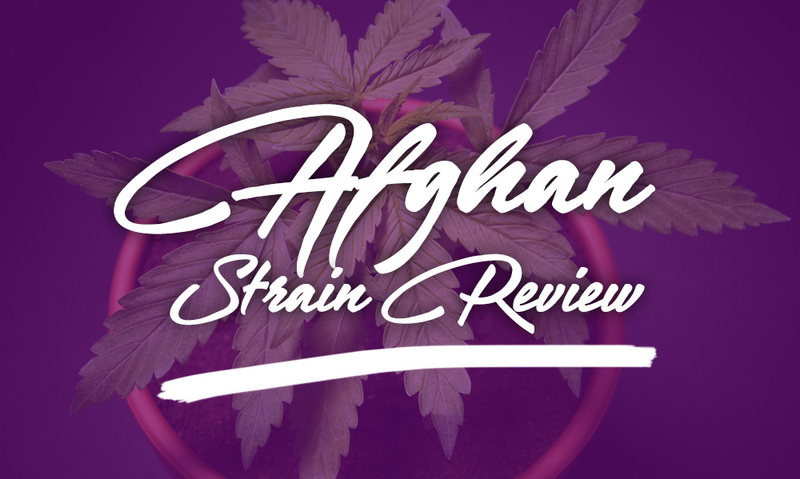 Some people are only interested in the Afghan Marijuana strain due to its potency, but strain experts know that the aroma of a cannabis plant also plays a crucial role in the overall experience level of the subject. Sweet aromas can boost the satisfaction level of a person due to the strong fragrance that is exuded while the subject smokes the strain. You undoubtedly won’t be dissatisfied with the Afghan Marijuana strain. Apart from its earthy smell and potency levels, the subject will also enjoy the sweet taste of the strain as it is smoked. Upon inhale of the smoke, your tongue will taste a sweet pine flavor, and as you exhale the smoke, the strain will leave a sort of spicy and chili taste in your mouth. The thing with this kind of strain is that it doesn’t have a single flavor. As sweetness and spiciness are present in the Afghani marijuana, it will also leave a sort of herbal taste in your mouth. Just like other Marijuana strains, you can’t escape from the negative effects tied with this temporary source of happiness. The key in a successful dabbing is striking the right balance. In everything in life, there is insufficiency and excess. Both aspects are bad especially in cannabis smoking. When having an overdose of the Afghan Marijuana strain, you can expect dehydration to occur, as well as cottonmouth, itchy and dry eyes. If you’re already used to Afghan dabbing, everything will be fine. The trouble is if you’re a novice smoker. In this case, you’ll probably experience a slight dizziness and mild headache. Since the Afghan Marijuana is a pure strain, you can also potentially experience paranoia. Cannabis plants are loved by recreational smokers, but the Afghan Marijuana is a type of strain that is enjoyed by even the medical users. People who use this type of weed usually are the ones who have a tough time balancing their happiness and loneliness levels. I am talking about people suffering from severe depression as well as chronic pain. The Afghan Marijuana strain gives them an avenue for relaxation and calmness. Depression and anxiety can result to lack of sleep. This is also another downfall that the Afghan strain can remedy. This kind of strain is also a great deal of help for cancer patients. After going through people living with chemotherapy cancer usually lose their appetite, but since the Afghan Marijuana strain is pretty good at spicing up the craving, consumption of this drug can potentially help with the healing process of the patient. This kind of strain is highly encouraged who wants to start as a career as a Marijuana grower. It is relatively easy to cultivate. Although the Afghan Marijuana strain can also be potentially grown in an indoor setup, my advice is to keep them in the out and the open. The best environment for this type of strain is where they can be exposed to sufficient sunlight. Be ready in the late September up to early October because this is the time frame for Afghan harvest. On average, you will probably get 21 ounces of cannabis buds. But if you can’t keep your plants outdoors, and would rather have them indoors, you can use the typical standard for indoor growing. However, you can only expect an average of 16 ounces per square meter. Also, you shouldn’t forget that harvest usually happens at seven to eight weeks from first day of cultivation.